Working within the realm of arts and crafts has been a core component in Elizabeth’s life since childhood. Her mother and grandmother inspired her love of beautiful handmade objects, as well as an appreciation of quality workmanship and attention to detail. Throughout her early education, she was always intrigued by studies requiring patience and concentration, particularly arts and mathematics. Growing up in Tennessee, she had many opportunities to learn about folk arts and master craftsmanship. During college she continued taking various arts and crafts courses and became increasingly attracted to pottery. Her interest in mathematics led her to a career in business upon graduation from college. 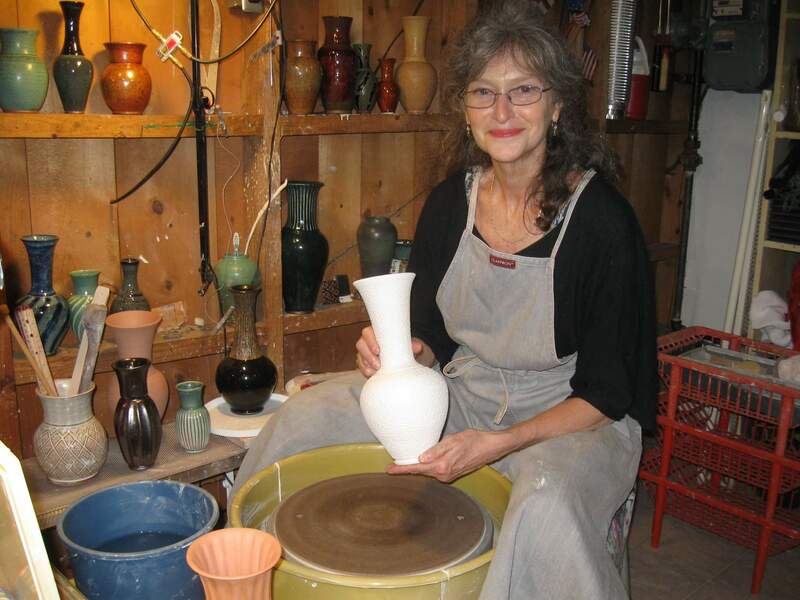 Throughout that career, she continued to develop her interest in the ceramic process with evening classes in various cities, as she moved with her husband who was pursuing his career in journalism. Eventually, they settled in Arlington, Virginia, and since 1990, Elizabeth has devoted all her time to family, as well as to a second career encompassing her love of working with clay. Fundamentally, the ceramic works of Elizabeth Greene reflect the intuitive aesthetic of a mostly self-taught potter. With a love for hand-crafted objects from throughout human history, she strives in her work to blend color, form and texture, together with an attention to detail that enhances the endless possibilities for each vessel she creates. For Elizabeth, the chemistry of ceramic arts is perhaps the most enchanting aspect of the process, bringing a never ending sense of exploration and discovery, as well as the element of surprise which continually reminds one of the unpredictability of this life, and the need to reconcile ourselves to the endless give and take in the natural world.